Of course, this wasn’t really Corbyn vs May, as the latter has refused to debate the former directly. Instead, first Jeremy Corbyn and then Theresa May faced audience questions followed by a grilling from Jeremy Paxman, who used to present Newsnight. Corbyn performance was by far the best he has given on a stage as big as this. Even people who disagree with everything he says, such as Nigel Farage, agreed. His critics conceded he must have had good media training. However, that is to fundamentally misunderstand the man. What you saw if you watched the debate is a politician who doesn’t use soundbites, who tries to answer the question if he can. But also, you see a politician who is campaign-trained and ready, after two successful leadership campaigns. He is also fundamentally decent. Witness for instance the answer he gave to the self-claimed ‘natural Labour voter’ who had become a business owner, and wanted to complain about raised corporation tax, a ban on zero hours contracts and a raised minimum wage as well as VAT on private school fees. In his mind, Corbyn could have pointed out the possibility that if he can afford private school fees he could afford to pay a decent wage, give decent contracts, and pay a corporation tax rate which is still less than it was in 2010 when the Conservatives took over Government. Instead, he answered the question at face value, pointing out how the combination of those policies would fund a fairer country in his view, pointing out that a better country is where as many people as possible do better. When he came to face Paxman, Corbyn came up against an experience one commentator described as like ‘when you have to patiently explain to the oddball next door that yes, the bins really DO have to be put out on Tuesdays’. Paxman was an interviewer who interrupted, made facial expressions, but didn’t actually properly probe his interviewees. Here, he went at the first two from the start, deciding to come at Corbyn, surprisingly, from his left. This meant focusing on why the manifesto missed out on many of the policies he believed in. Corbyn explained that the manifesto was a joint effort with the party and he had had to compromise, which is, you know, what politicians do. Paxman then decided not to talk about any current policies but to run through everything Corbyn had said and done in the past, when he was, and even before he was, a campaigning constituency MP. The IRA, Palestine, the Falklands, all were there, and Corbyn is so used to answering questions on them that it didn’t really trouble him. Theresa May, though, was troubled from the start by a question about police cuts. She was also questioned on education cuts. She tried to answer with her practiced soundbites, but this isn’t her kind of event. May last had to campaign properly in 1997, when she finally got elected to Parliament. She didn’t even have to campaign to be Party leader once. It shows, as she isn’t anywhere near as skilled at handling an audience. Two particular issues arrived here – she pointed out that Labour’s figures don’t add up, to be met by laughter from the audience who pointed out her manifesto had no figures at all. Most oddly of all, the Tories’ strategic mess over social care managed to get a Tory leader into trouble with a question from an old man in a blazer with a crest on the front pocket about inheritance…a Tory leader! Paxman pointed out that with all the u-turns May had made she was essentially a ‘blowhard’ who said a lot then turned back under any pressure. There was also a rather testy exchange over immigration, and the undelivered, and still ridiculously committed to, target of net migration being under 100,000. 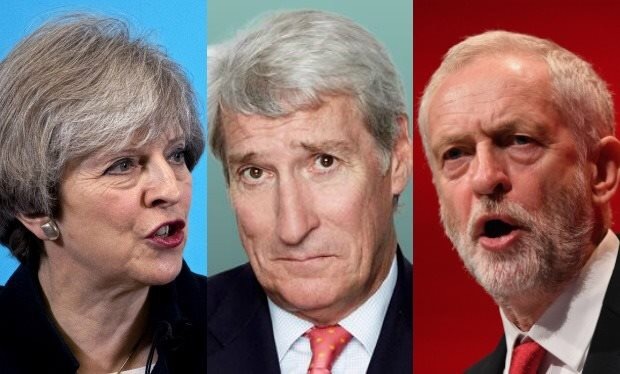 Theresa May tried out her ‘death stare’ at Paxman at one point, but the impression one got was that whilst the audience laughed WITH Jeremy Corbyn they were laughing AT Theresa May. That shouldn’t be a surprise really, May had the hardest job in Politics for seven years, and now has the second hardest job, so she has been at the forefront of Government, making choices, making compromises, and thus having to govern in prose whilst Corbyn continues to campaign in poetry. Let’s also remember that May knows she is likely to win and doesn’t want to get caught out promising things she can’t deliver (apart from on immigration) whilst Corbyn may be painting a brighter vision of the country, but he is still essentially bribing people with other peoples’ money, and that isn’t exactly a difficult job. What I would say is that Jeremy Corbyn did accomplish something I had wondered would be too difficult for him..he finally looked, well, Prime Ministerial.